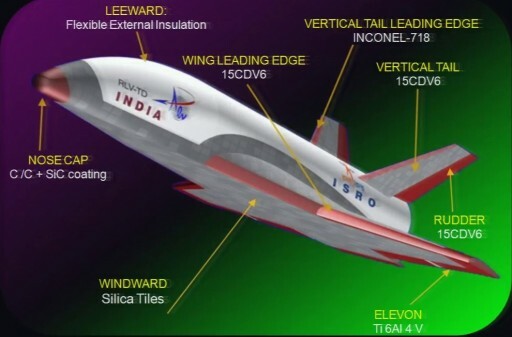 India’s first winged space plane will take flight on Monday for a 10-minute test flight representing the first small step in an ambitious development program for a re-usable launch vehicle combining rocket and air-breathing propulsion technology. 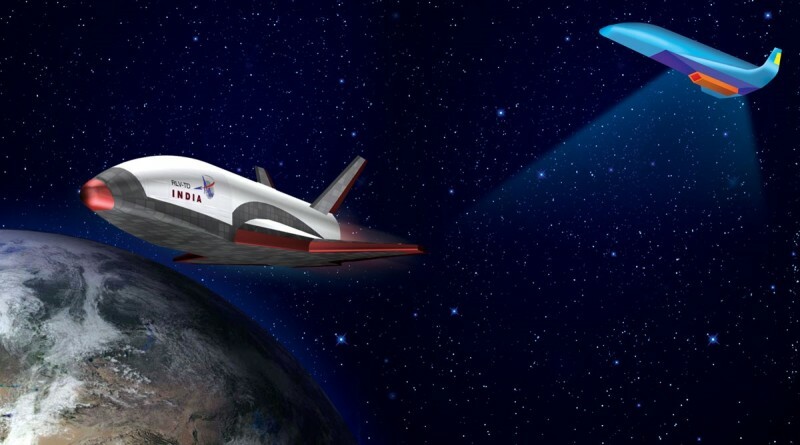 The Indian Space Research Organization is gearing up for the first flight in its Reusable Launch Vehicle Technology Demonstration Test Program, involving a miniature space plane completing a sub-orbital test flight for a demonstration of the hypersonic flight characteristics of the vehicle. 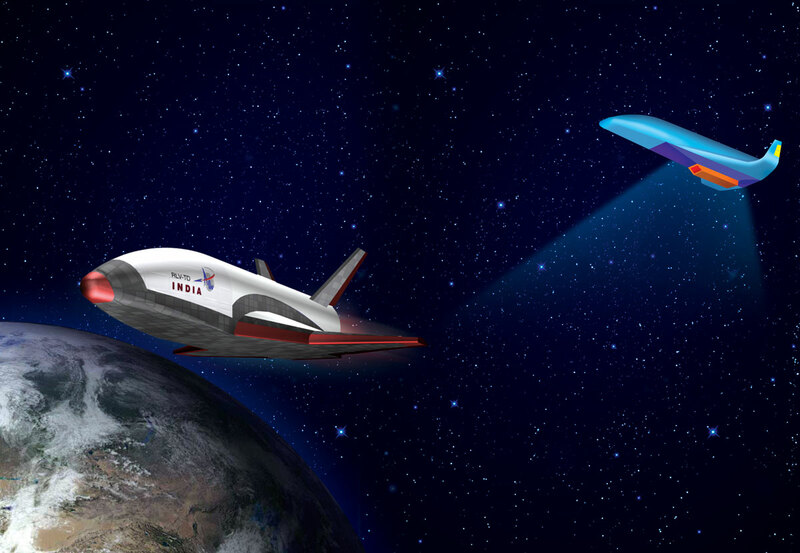 Launched atop a 9-ton solid rocket booster, the spaceplane will go through a hypersonic re-entry and complete maneuvers in the atmosphere to demonstrate its aerodynamic design and provide knowledge for future test flights that will aim for an autonomous landing on a runway. The RLV-TD project aims to develop a number of technologies including powered cruise flight, hypersonic flight control, autonomous landing and air-breathing propulsion. The overall goal of the program is to validate technologies needed to realize a fully re-usable Two-Stage-To-Orbit Launch Vehicle combining rocket and scram-jet technology. RLV-TD had a long road to the launch pad. Design work was started over a decade ago and ISRO mentioned over a period of years that the RLV could lift off the drawing board for launch within two years after approval is given. The approval finally came in 2012, though the program was plagued by a number of delays ultimately pushing the first test flight into 2016. Monday’s test, known as HEX – Hypersonic Flight Experiment – is only the first in a program of at least four tests to deliver the data needed for the development of the Two-Stage-To-Orbit Vehicle. 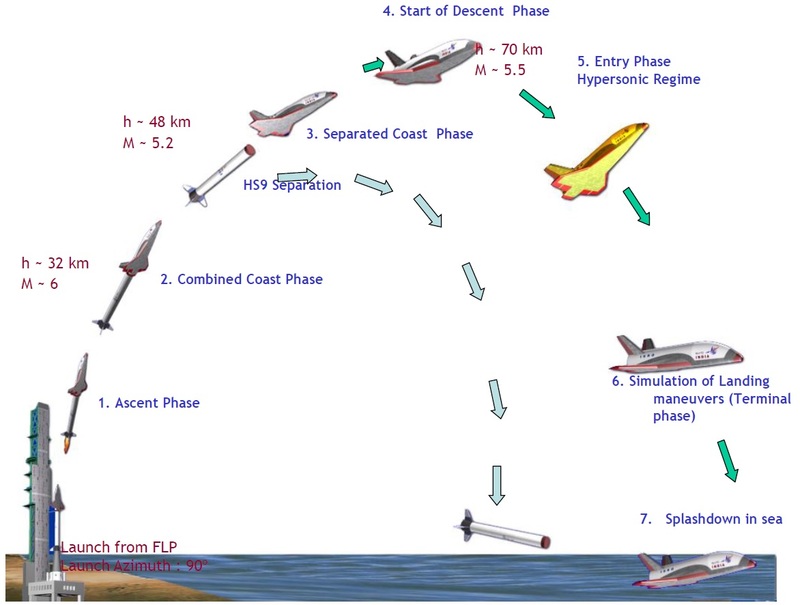 In another test, the Reusable Launch Vehicle-Technology Demonstrator (RLV-TD) will be dropped from an aircraft and complete a demonstration of an autonomous runway landing. This will be followed by a Return Flight Experiment combining the first two test missions by launching the vehicle to high speed and then having it maneuver back to a runway landing. 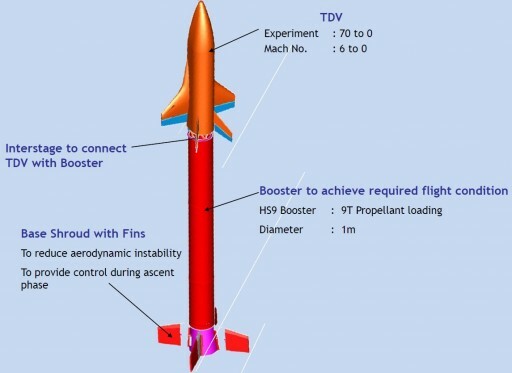 The fourth test of the program will incorporate a scramjet engine to accelerate the RLV-TD to hypersonic speeds followed by a return to a landing strip. The RLV-TD is not a prototype but rather a scaled down testbed in use for the first steps in India’s exploration of novel launch vehicle technology. The craft – about 6.5 meters long with a fuselage diameter of one meter – closely resembles a mini Space Shuttle like the American re-usable X-37B in operation by the Air Force. RLV-TD has a mass of around 1,750 Kilograms and features a delta-wing design with a pair of angled tail fins. Around 600 Thermal Protection Tiles are affixed to the underside of the space plane and its nose features a carbon-carbon cap to withstand temperatures of 1,200°C occurring at re-entry. The RLV-TD is set for liftoff at 4 UTC on Monday from the Satish Dhawan Space Center on India’s East Coast, relying on a slow-burning solid rocket motor to accelerate it to hypersonic speed. The H9 Solid Rocket Motor holds approximately 9,200 Kilograms of packed propellant and burns around 70 seconds with an average thrust of 32,500 Kilogram-force, using a Secondary Injection Thrust Vector Control System fed from a toroidal tank installed around the nozzle throat. H9 will accelerate the vehicle to a speed of Mach 6 with burnout at an altitude of 32 to 35 Kilometers. RLV-TD and H9 will separate 48 Kilometers in altitude and the space plane will continue coasting to an altitude of approximately 70 Kilometers. 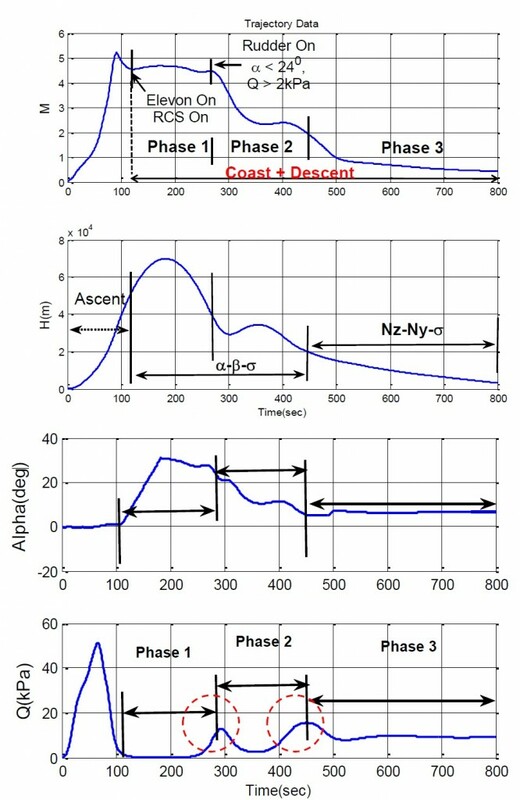 At that point, the critical Descent Phase of the mission will begin. After separation, around 110 seconds after launch, RLV-TD will activate its Reaction Control System and the elevons will become active to control the craft’s orientation to set up for re-entry, increasing the spacecraft’s angle of attack. The RLV-TD craft is equipped with a multitude of load, temperature and pressure sensors to study the loads experienced by the vehicle during re-entry, allowing a detailed assessment of the aerodynamic design of the winged space plane. Data is transmitted to the ground through an S-Band patch antenna while tracking employs a C-Band beacon installed on the vehicle. Passing 40 Kilometers in altitude, RLV-TD activates its rudder to begin a guided flight segment. Around five minutes into the flight, the vehicle will pitch down to enter its Terminal Phase dedicated to a series of landing maneuver demonstrations beginning in an area of increased aerodynamic pressure and continuing for around two and a half minutes while the vehicle slows from Mach 3. Flush Air Data Sensors embedded in the vehicle’s nose will be used to assist in navigation and control during atmospheric flight starting at Mach 2.5. Employing its rudder and elevons, RLV-TD will aim for a pre-determined point in the Bay of Bengal to demonstrate it could accurately maneuver to a landing strip. Gliding back to a virtual runway around 500 Kilometers off the coast, RLV-TD will splash down a little over ten minutes after liftoff. It is expected that the craft will not survive the impact in the water and recovery is unlikely. Flight data is transmitted in real time, delivering all relevant data to the engineering team prior to impact for a complete study of the vehicle’s aero-thermal dynamics in the high-speed re-entry regime as well as the performance of the silica thermal protection tiles and carbon-carbon nose cap. Atmospheric guidance will also be studied to evaluate whether the vehicle is ready for future runway landings. ISRO engineers characterize the planned experiment as the first ‘baby step’ towards an operational reusable launch vehicle that is likely 10 to 15 years away. The operational version of the vehicle would be at least five times the size of the RLV-TD testbed and feature a combination of air-breathing propulsion and conventional rockets. Aiming for low cost, reliable and on-demand space access, India’s future re-usable launch vehicle could cut costs for space launches by a factor of ten, ISRO hopes. The European Space Agency conducted an initial validation of reusable launcher technology last year with the sub-orbital flight of the Intermediate Experimental Vehicle which – while comparable in size and mass – completed a much faster entry demonstration than India’s RLV-TD. Marking India’s first step in re-usable launch vehicle technology, Monday’s test is widely watched by ISRO’s followers and it is hoped that the remaining RLV-TD test flights can be performed over the coming years.